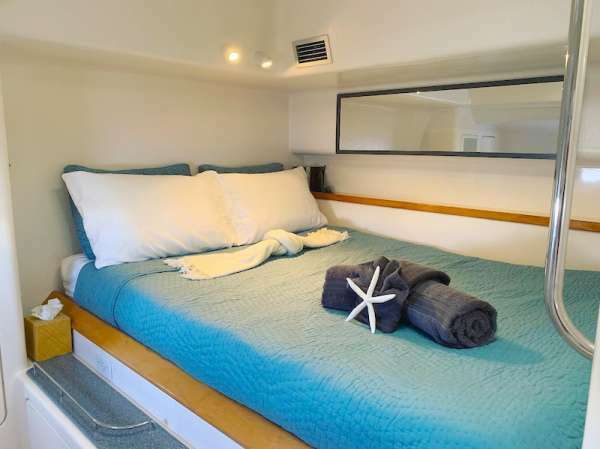 Catamaran Pelican is a 2002, 58' Voyage catamaran offering crewed yacht charters in the BVI & USVI. 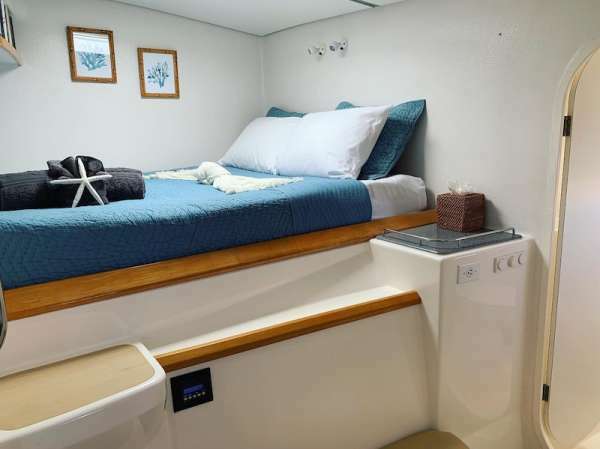 She features on-board diving for certified guests and accommodations for up to 10 guests in 5 Queen cabins. 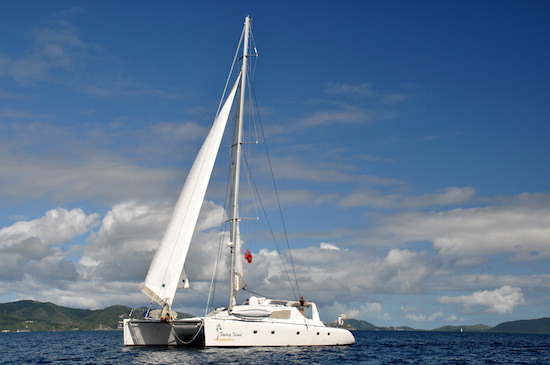 Catamaran Pelican is a Carefree Yacht Charters affordable pick for families, couples, divers or special occasions. 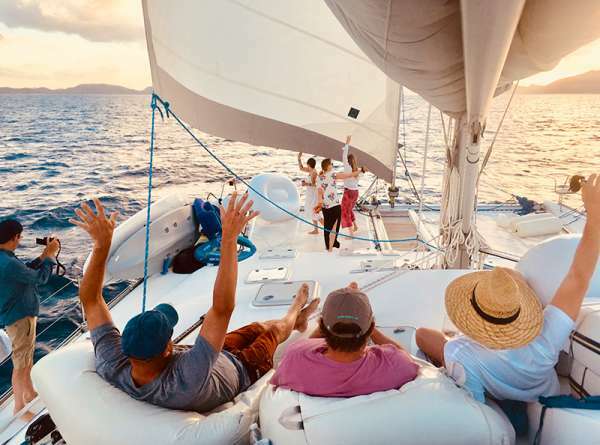 Here's what Shawn & Autumn told Carefree Yacht Charters about their favorite type of charter group: "We enjoy all types of groups that come onboard. 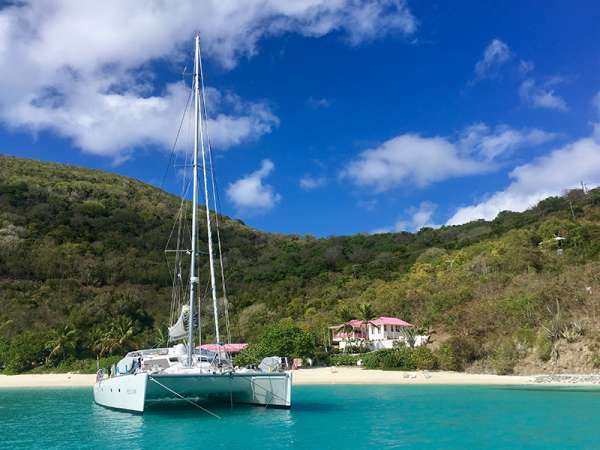 Our favorites are those that want to really see the beauty of the BVI and have fun going on adventures in the water and on land. Autumn loves creating new and interesting dishes for the adventurous foodie!" Rates from $18,500 to $23,000. View availability and rate details. To learn more about this crew or for further details about PELICAN, call us in our South Florida office at (954) 980-9281, toll free at (888) 670-6884 or fill out our Quick Request Form. 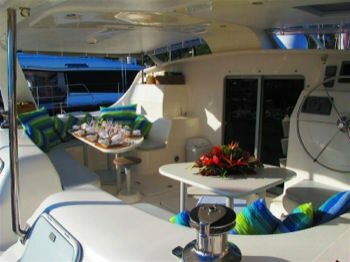 Xmas week - up to ten guests: $25,300 New Years week - up to ten guests: $26,300 Charters outside the Virgins: Regardless of whether or not a vessel may or may not include taxes in the vessel's listed charter fees for Virgin Islands charters, in general, no fees, port dues, nor taxes are included in the charter fee for any charter outside the Virgin Islands unless otherwise agreed. We just got off the boat a few hours ago and now waiting for our flight. The entire experience was amazing. I appreciate all your dedicated planning and making everything happen that we requested. We could not have asked for a better service than you provided. It was truly amazing. The photographer and spiritual adoption went perfect and could not have gone any better. Both the photographer and spiritual adoption was perfect. 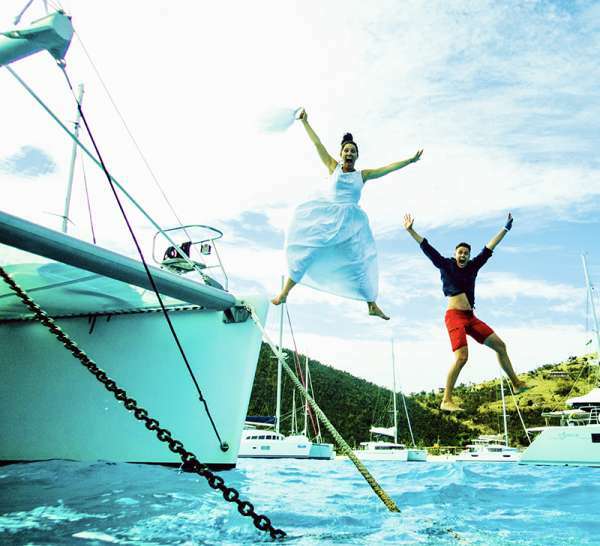 The pictures turned out amazing and she did everything we requested even going back to the boat for some amazing pics of the family jumping off the boat. Shawn and Autumn were truly amazing and a great crew. Shawn listened to our request and with his expertise of the area made it all happen flawlessly. Autumn, oh my she is awesome. We ate every meal like we were at a 5 star resort. She is an amazing chef. All the celebrations had a special meal or dessert and the entire family couldn't give Autumn enough of kudos. We wanted to jump from a rock and we went to an amazing spot. We wanted a great meal on shore and went to an amazing restaurant and the list goes on. Gracie wanted her hair braided and it happened. We all got massages that Autumn booked and they were amazing. They are a great crew and work so well together. We invited them to come visit us in California and Colorado. They are a rock star crew and couple. We absolutely loved the experience and Shawn and Autumn made it better than our highest expectations. Thank you and yes you can put us on the newsletter list. What a trip it was. Good morning and I hope this email finds you well. 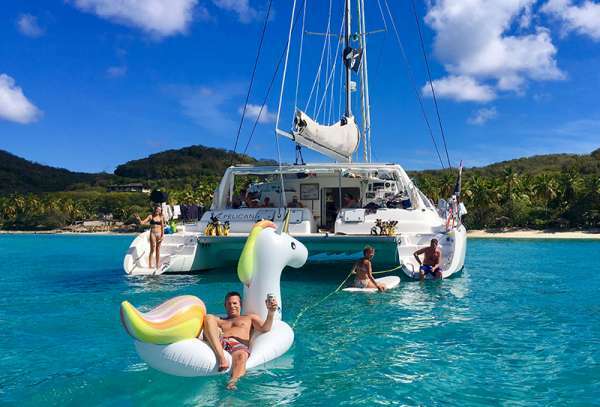 My dad asked if I would like to leave a comment on our recent BVI trip on Pelican and I said definitely. First off, I would like to say thank you to you for everything that you did to help us plan and organize this amazing trip. Your expertise, advice and knowledge made for a smooth and relaxing trip for our entire family. Thank you again for answering all our questions over the last 2 years as we prepared for the trip. 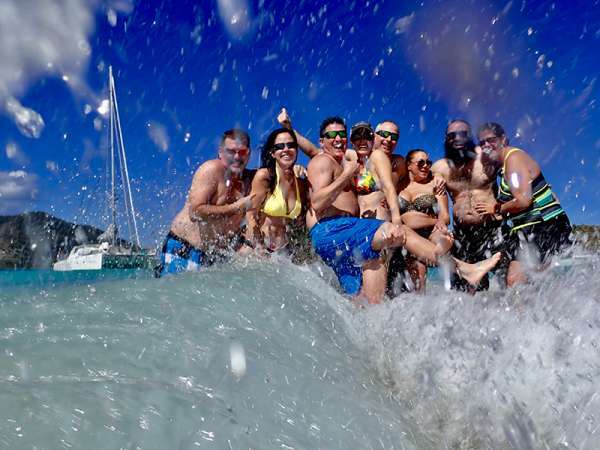 Unbelievable, amazing, trip of a lifetime, relaxing, memories made are all words I would use to describe the week we had while sailing on the Pelican in June. There are two people who helped make this trip so incredible and they are Paul Porter (our captain) and Kristen Berg (the chef). From the time that we arrived in St. Thomas at the Yacht Club until the day we departed St. Thomas both Paul and Kristen were nothing but helpful, fun, a joy to be around, knowledgeable and so sweet. It was so fun watching Paul and Berg work so well together on the Pelican whether it was cooking, cleaning, answering all our crazy questions, navigating the boat, helping us put on our gear, putting up the sail or anchoring the boat. They are a flawless team that made our experience even more memorable because we got to know them so well throughout the week and now we have become friends. Kristen did a stellar job feeding us throughout the week creating some of the best dishes we have ever had while still preparing amazing meals for some of us "picky" eaters. I am pretty sure we all gained a few extra pounds after a week of her amazing meals but it is all worth it. 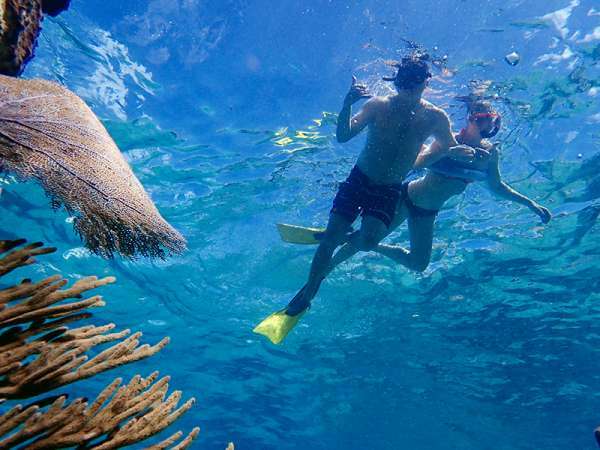 Paul took us to some of the most gorgeous places we have ever seen and always made sure we were comfortable while diving, snorkeling or swimming. Paul always got in the water with us to help guide us while diving or snorkeling to make sure we saw some of the prettiest underwater life we have ever seen. This truly was a trip of a lifetime and something we will never forget and for that our entire family thanks everyone involved who made that happen. We have already started the "talks" of our next trip and hopefully we can bring our kids to experience this amazing vacation like we did. Thank you again Lynne, Paul and Kristen for your impeccable hospitality and memories that will last a lifetime! 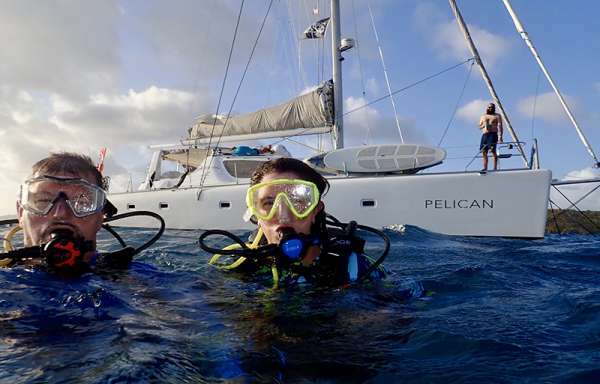 I wanted to send you a quick note to thank you for all you did to make our charter on Pelican/BVI experience happen. You coordinated everything with my mom (Beverly) and she has nothing but good things to say about your communication and helpfulness. We all had the experience of a lifetime during our week on Pelican. I literally sobbed on the way home with a mix of gratitude (for how wonderful the trip was) and sadness (for it being over)! Our whole family felt the same way - we were all in a slight depression the first few days after we got back! Paul and Lauren played a big role in our positive experience. They both made us all feel comfortable from the moment we stepped aboard to the moment we hugged them goodbye, and were always in tune with everyone's needs. Lauren took all of our preferences into account when stocking the boat with food and prepared the yummiest meals and snacks! Some favorites that stood out to me were her seared salmon + salad, poke bowls, grouper, and ceviche (basically alllll the seafood). Lauren's laid back style was super relaxing and made it easy for us to chat with her throughout the day while she was cooking. She was always open to sharing cooking tips/tricks too, which I really enjoyed. She had a lot of expertise about diving/sailing and amazing stories about her travels and sailing experiences - she could have entertained us for hours! We enjoyed her company so much that we were sad she couldn't go on outings with us because she had to cook. There was also a time that I wasn't hungry for lunch and Lauren thoughtfully saved me a plate for later without me even asking - super considerate :) She and Paul got along really well and communicated very professionally. Paul is amazing at connecting with everyone (of all ages) and making them feel like a valued member of the "crew." He made sure that we got to do all of the activities our group was interested in like kite boarding, wake boarding, cliff jumping, snorkeling, scuba, hiking, etc. He was also flexible/laid back, and allowed my sailor dad and brother to take the helm and adjust the rig to their hearts content. Somehow, despite the 24/7 work that goes into being the captain of a week-long charter (with a very active group), Paul maintained a positive energy and enthusiasm for everything we did. He was quietly confident in his abilities, and that really helped calm me down when he took my entire family scuba diving (I failed to get certified in time). He has a lovable personality - a mix of kindness, optimism, and humor - that I think resonated with everyone too. Oh! And photography skills were a big bonus! We couldn't have chosen a better duo to show us the BVIs - by the end they felt like family. We are ridiculously grateful for our week on Pelican and we will never forget it. 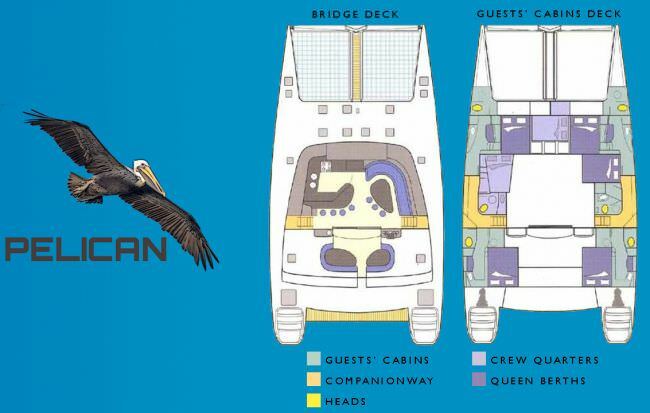 It has now been three weeks and one day since the we first boarded Pelican. We were a party of 8; five ages 23-28 and three ages 55-60. We all had our individual ideas of what the trip would be like, but this trip far exceeded everyone's expectations! We boarded with excitement and anticipation. Right away Paul and Lauren made us feel at home. Paul and I had spoken a few times prior to the trip. He was extremely responsive, friendly and helpful during our phone calls, texts and emails. He answered all my questions and made me feel at ease immediately. He even set up transportation for us to get from our VRBO rental to the pick-up location. Once we got to the boat, we took off our sandals, put them in the "shoe basket" and stepped aboard. After a brief orientation to the boat and being shown to our cabins, we were on our way and the magic began. The younger folk made themselves at home on the large beanbag chairs on the front of the boat, while the less young ones stayed in the back. 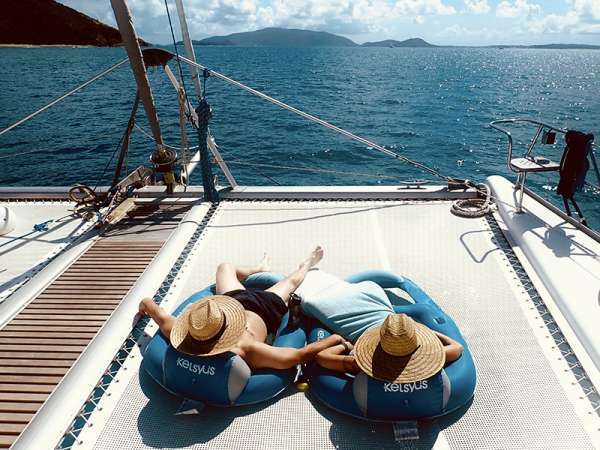 Paul set me up with a bean bag chair on the side of the boat where I found myself retreating to day after day. I could kick back with the wind in my hair and relax like never before. 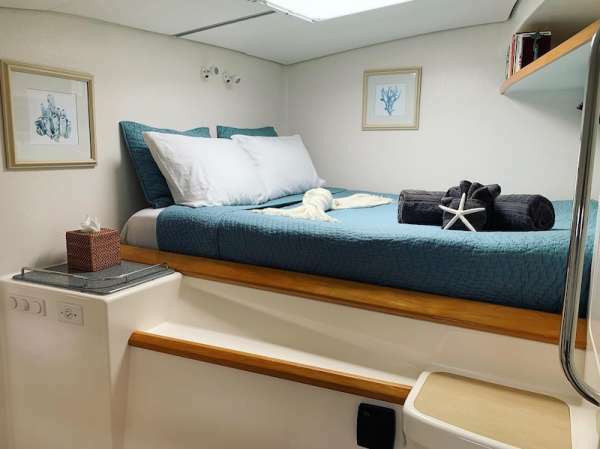 Pat, my husband, practically attached himself to Paul's hip from the first minute on board, anxious to learn everything he could about Pelican and how to sail such a vessel. I should mention that Pat and all the 20 somethings are avid sailors. Paul didn't mind a bit that Pat was now his right hand man at the helm. He answered all Pat's questions and allowed Pat to help out as much as he wanted to. Pat and our son, Oliver were in their element. Paul is a great communicator. He was never to busy to answer any and all questions we threw at him from start to finish. I should also mention that Pat wanted to bare boat on this trip, but after the first day, he was singing Paul and Lauren's praises and wondering why anyone would ever want to bare boat when there are people like Paul and Lauren to take care of absolutely everything and everyone! For the first time in Pat's life, he did not have to be in control and truly had a vacation. Our first stop was lunch. We had been underway for about 2 hours when Paul comes out to set the table. We were happy that the table on the back deck seated all 8 of us perfectly. It was shaded and warm and the perfect place to indulge in all Lauren's creations. Chef Lauren came out to announce what she had prepared for us, which she continued to do throughout the trip. Our first meal on the boat set the precedence for things to come. Each meal was better than the last, which seemed impossible, but it kept happening. We spent most of each meal verbalizing to each other how much we loved it. Lauren's presentation of food was over the top. I think we took a picture of every meal because they were so beautifully plated. We had read Lauren's resume, but were not prepared for the gourmet meals she would prepare for us each and every meal, each and every day. She is an AMAZING chef and never ceased to impress us; breakfast, lunch and dinner. She wowed us with her creations both in food and drink! Her knowledge of cocktails mixology kept us all in good spirits! We spent as much time hanging out in the galley with Lauren watching her prepare meals than we did on the deck. Besides being an amazing chef, she is funny, so funny and such a great conversationalist. She knows a little bit about everything and entertained us daily with her travel stories. She is a gem of a gal and I hope to remain friends with her for years to come. I've already adopted her and invited her to spend Thanksgiving with us! Chart talks with Paul were always exciting. That's where we would learn what our next adventure would be. We would all sit around the deck hanging onto Paul's every word. He would show us on the map where we were, where we had been and where we were going. Paul was our captain, but he was also our adventure guide extraordinaire and the best part, he went on every adventure with us. I'm pretty sure there is nothing Paul is not good at. He took us on hikes with amazing views. We participated in extreme snorkeling adventures which entailed caves with back doors. 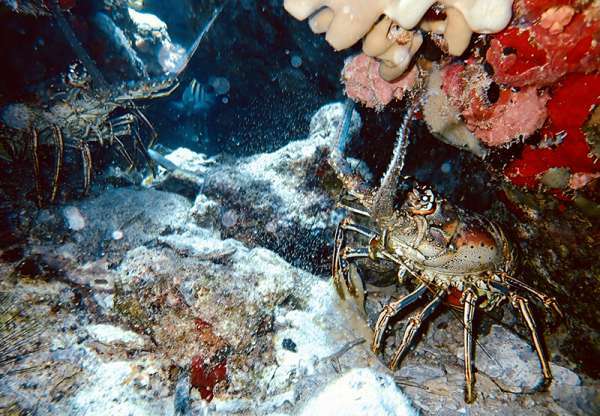 Paul took us scuba diving to ship wreck sites where we saw sharks and barracudas and lobsters and turtles. 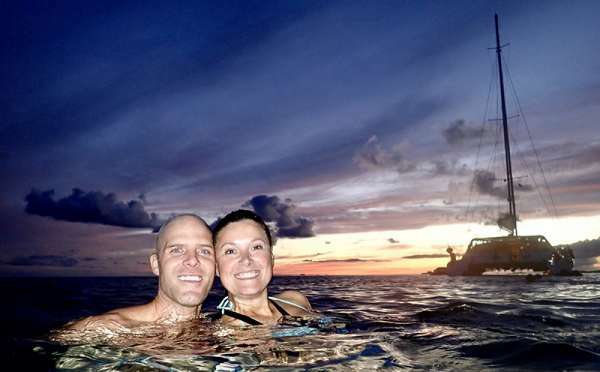 It was our first time to dive inside a ship wreck and Paul made us feel safe and relaxed. He took us cliff jumping, which entailed rock climbing up the side of a huge rock in the middle of the water. We went on night swims with huge Tarpon. A few in our party are into kite boarding. Paul set up a full day of kite boarding on Anagada with lessons for those of us who have never tried it. Tim and Tommy, our kite boarding instructors were too much fun! Afterwards we went to a fun bar for conch and ended with a friendly game of basketball which both Paul and Lauren played in! I have some great pics and videos of the game. Paul took one for the team and came away with a skinned up knee. Our night on Anagada ended with a lobster dinner on the sand, and dancing with Paul and Lauren! Needless to say, we had a blast! We snorkeled to The Baths, then hiked all around and chilled at the beach for a bit. The Baths were breathtakingly gorgeous. For those who wanted to go, we even took a fun dingy ride to fill up the scuba tanks. We spent our days sailing from island to island and finding adventure everywhere we went. One day we anchored just down and around from the Bitter End and spent the last half of the day wake boarding, paddle boarding and canoeing. On the shore, the guys made a make shift table with four chairs out of hurricane debris which they placed in the water and played a drinking game that involved dice. That same evening, Paul taught us a fun new game called Tucky Ball, which involved a ball and water and a lot of laughter! I cannot even begin to tell you everything we did both on and off the boat. There are just too many wonderful memories to write about, but they all live in my heart and mind and they make me smile often. We spent our evenings sitting around the table eating fabulous food, drinking yummy cocktails, talking and laughing and enjoying each others company. Our last night on the boat was bitter sweet, but Lauren and Paul made it so much fun. By that time, Paul and Lauren had become part of our family. We ate, drank, laughed and danced the evening away. This was the vacation of a lifetime and we all know it. It was magical in a way that you can only understand if you were there with us. When I think about all of us together on Pelican, I can't help but get teary. My heart swells with joy and emotion every time I talk about our trip. We are in the process of making a digital photo album of our memories. Thanks to Paul's great photography skills we have amazing photos to document each and every memory. Paul helped us reenact the journey on our last day. We wrote down every stop and every adventure at every stop. We plan to make a photo book to include a map of our destinations. We don't want to forget a single detail of this trip. I could go on and on about how fabulous this trip was. 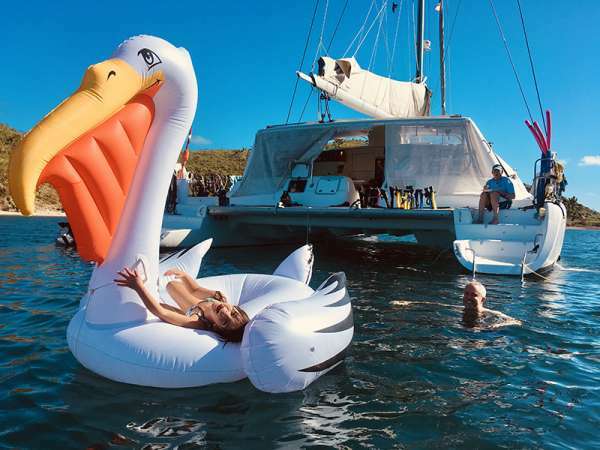 I have and I will continue to recommend a vacation aboard Pelican to everyone I know. 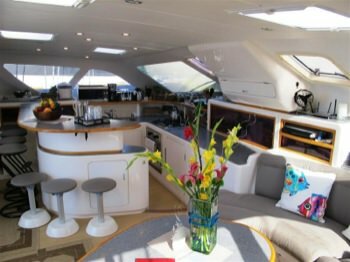 Thank you so much Lynne for finding Paul and Pelican for us when we were first starting our search for the perfect boat and crew. Lauren was an added bonus!!! I can't imagine what the trip would have been without her on board. She and Paul work together so well. They were the perfect crew for our group or for any group for that matter. 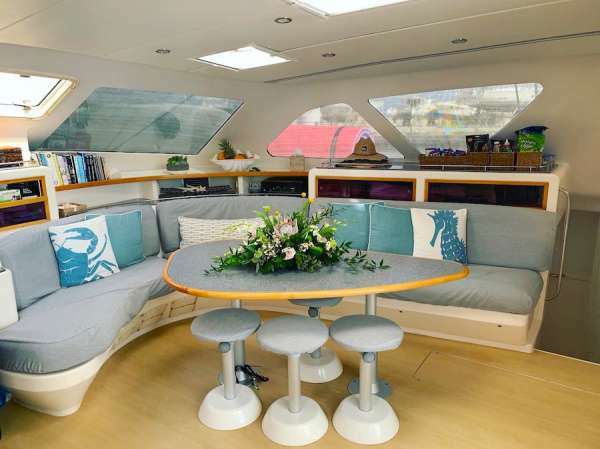 Pelican is such a comfortable boat, even for a party of 8. 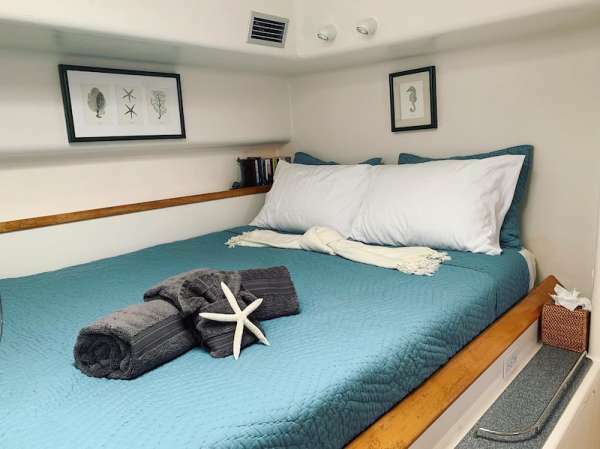 We all had a roomy cabin with a super comfortable bed. The temperature at night was perfect too, not too hot and not too cool. It was roomy and spacious and I slept like a rock every night. Paul and Lauren spoiled us and we let them. I can't think of a single negative about the trip. From Lauren's made to order breakfasts in the mornings to Paul's star gazing at night, each day was the best day ever! Thank you, thank you thank you, from the bottom of my heart for being a part of this most wonderful memory!